I am 43 years old and I desperately want to learn how to swim, but I get very scared because I cannot touch the bottom of the pool. What can I do to overcome this? The problem you are describing is actually the easiest part to deal with. The hardest part is learning to swim first of all! Learn to swim within your depth first. 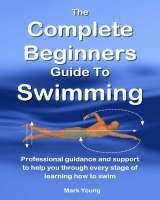 Learn to become comfortable in the water, learn how to stop and stand up whilst moving without your feet on the pool floor. Once you have become happy swimming short distances within your depth, then swim a short distance in water of about shoulder depth. Now the important part: IMAGINE you are not able to touch to pool floor - swim away from the side, change direction and then swim back again, all without touching your feet down and all within your depth. Practice this within your depth until you can do it confidently. Psychologically it makes no difference what depth the water is if you are confident that you can change direction and swim to the side of the pool. Always learn to swim gradually and at your own pace. Move on when you are confident within yourself. Rome wasn't built in a day!